Although myths and legends are by definition largely untrue, each one of us has a little inkling in us that suspects there may be some truth to the story. Regardless of your assertion that you do not believe in such things, it is still fun to hear the mythical stories tied to a vacation destination. They give a great insight into the people and culture of the region, as well as offer an explanation on seemingly strange behavior you might encounter. Here are some of the most prevalent legends of the Dominican Republic. Nkisi (plural minkisi, zinkisi or nkisi [n- concords with mi-] according to dialect). The term nkisi is the general name for a a spirit, or for any object that spirit inhabits. It is frequently applied to a variety of objects used throughout the Congo Basin in Central Africa thought to contain spiritual powers or spirits. The term and its concept have passed with the enslavement of Africans into the Americas, especially South America (in Palo Mayombe the spirits of nkisi are often called “[…]”). The current meaning of the term derives from the root, *-kitį- referring to a spiritual entity, or material objects in which it is manifested or inhabits in Proto-Njila, an ancient subdivision of the Bantu language family. 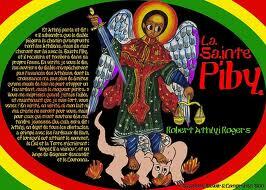 The Holy Piby, a book founded by the Holy Spirit to deliver the gospel commanded by the Almighty God for the full salvation of Ethiopia’s posterities.